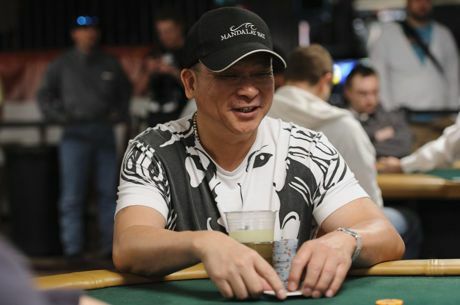 Born in China, Johnny Chan came to the United States in 1968 with his family to Arizona. After a few years spent there, Chan and his family relocated to Texas where his family owned a restaurant in Houston. Planning to keep with tradition and take over the family business, Johnny took classes at the University of Houston. But at the ripe old age of 21, decided to take a different road and become a professional poker player. It was then that he decided to move to Las Vegas. With a bankroll trend line that represented something like a sinusoidal curve, Johnny was often forced to pick up temporary jobs in order to keep his head above water. Young and determined though, he stuck at it and eventually began to pull in consistent winnings around 1982. It was then that Chan would enter The America’s Cup of Poker and gain his nickname “The Orient Express”. Chan got this nickname from Bob Stupak after watching Johnny eliminate 13 out of the 16 opponents in just over a half an hour of time, eventually going on to win the tournament. From there, a star was born. Johnny won his first WSOP bracelet in 1985 in the $1,000 Limit Hold’em event. A couple years later in 1987, Chan would win the $10,000 Main Event and then follow it up with a repeat performance in 1988. What some people sometimes forget or don’t know about is that in 1989, Chan almost pulled off the three-peat after he battled all the way down to the final two players of the WSOP Main Event. Phil Hellmuth got the best of him that day, but that would be far from the end of Chan’s bracelet glory. He added seven more bracelets to those first three, for a total of 10. Only Phil Hellmuth has more bracelets (11) and one other player, Doyle Brunson, holds 10. Chan was the first to reach double digits though when he defeated Phil Laak in 2008 for his tenth bracelet. Outside of the World Series, Chan does very well in other televised events. He has four victories in NBC’s Poker After Dark and also done very well in the Poker Superstars Invitational Tournament. In that series, Chan placed second in February of 2005 and later won the second installment of the event in the summer of that same year. Chan has also won events at the L.A. Poker Classic, participated on High Stakes Poker, and was elected into the Poker Hall of Fame in 2002.